Little is known about the motoring work of Peter Allingham Henville. A painting exists of Triumph Roadster. 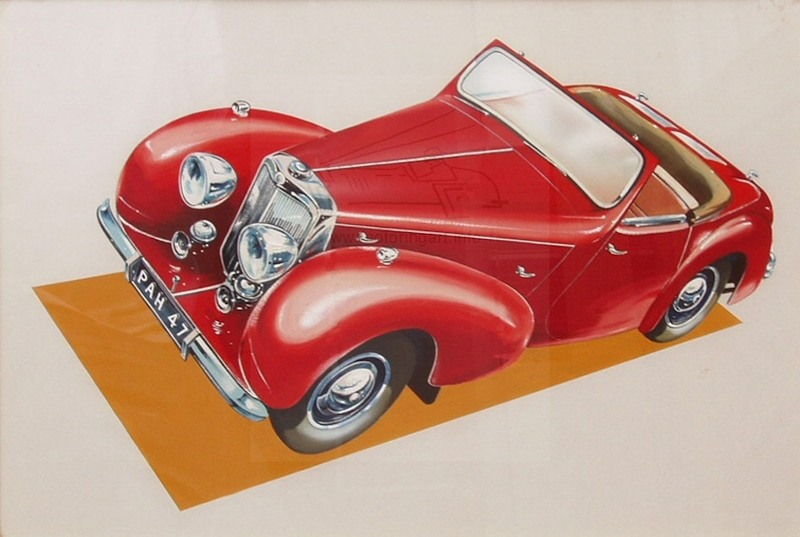 This has a label on the reverse written in 1985 indicating that the watercolour is the original for the Triumph Motor Co. in 1947 by the commercial artist Peter Alan(sic) Henville. Although the artwork is not traditionally signed, the registration PAH 47 confirms the details of the label. No doubt Henville was one of the backroom or freelance artists employed by motor companies like Triumph who produced art for publicity material and did not normally sign their output. Henville also signed the Morris Cars artwork for a front cover of the Autocar dated 15th August 1952. (Unusual to see signed front cover artwork at such late a date). Also the Morris Minor advertisement shown below from June 1957 has the initials PAH below the nearside front wheel. However, researching via the internet, there are references to a Peter Allingham Henville an artist who illustrated brochures and books including some BMC/Leyland car and truck brochures. So I assume that Alan and Allingham are the same person and that the person who wrote and dated the label 40 years later was in error. It could be that Henville was an important motoring artist of his time, in an era when so little of the publicity artwork was attributed to the artist.